Former champion trainer Peter Walwyn has died at the age of 84. Walwyn enjoyed success with Grundy, which won the Derby at Epsom in 1975 as well as the Irish Derby and Irish 2000 Guineas. Grundy went on to defeat Bustino in the King George VI And Queen Elizabeth Stakes at Ascot, a race often described as the best of the century. 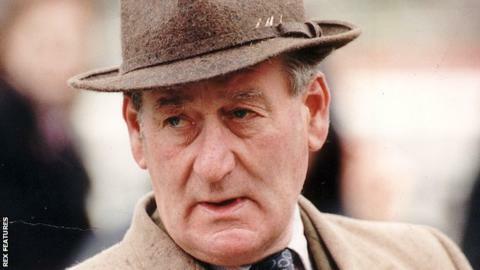 Walwyn became chairman of the Lambourn Trainers Association (LTA) in 1989 before retiring from training in 1999. He was awarded an MBE by the Queen in 2012 for his services to horse racing. The current chairman of the LTA, Merrick Francis, said: "Even at the very end he was ringing me up and checking I was doing things properly - it's very sad news. "He's been 'Mr Lambourn' all his life and achieved an almighty amount. "He was even responsible for the signs that say 'Lambourn - Valley of the Racehorse' when you drive into the village." Walwyn also enjoyed success in the Oaks with Polygamy in 1974 and the 1000 Guineas with Humble Duty in 1970.